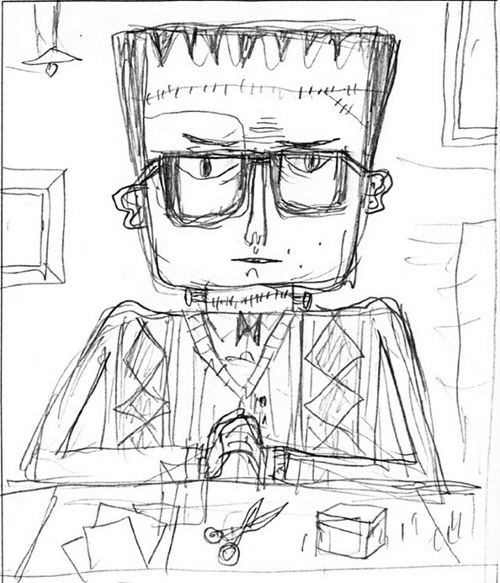 And, finally, we have author/illustrator Dan Krall. 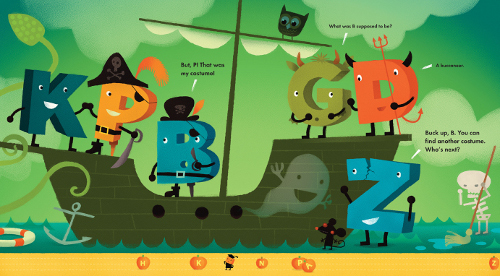 (My favorite part of his web site is the “Difficult to Classify” category, and not just because the Mad Tea Party art he created specifically for 7-Imp is the first illustration that pops up.) 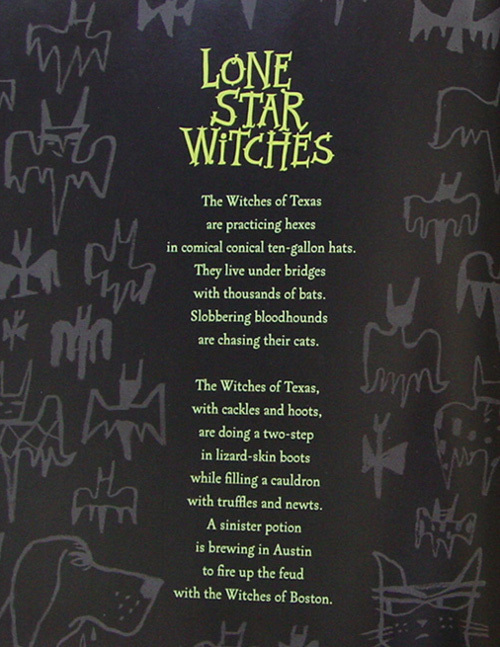 While his latest from Tricycle Press (September 2010) is not a Halloween title per se, I think beastly children are terrifying enough for it to fit in this post. So, I asked him if he’d like to stop by, too. 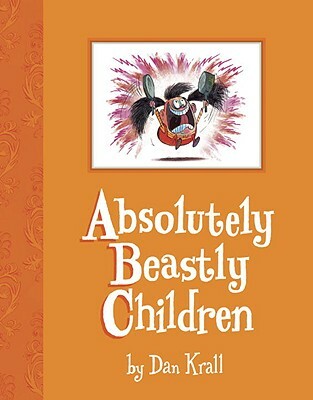 Absolutely Beastly Children, writes Kirkus, “revels in its own outrageous behavior.” To be sure, we see lots of children’s books satirizing naughty children, but something about Dan’s over-the-top art (perhaps it’s that he comes from the world of animation/television) is both dark and funny. (I mean, really: Check out the whiner below.) There’s no commentary here, no reminding children to behave, just an abecedary of awful. My own children find the alphabet of heinous behavior fascinatingly repulsive, in large part due to Krall’s spastic, colorful art. Which means they love it and want to hear it repeatedly. 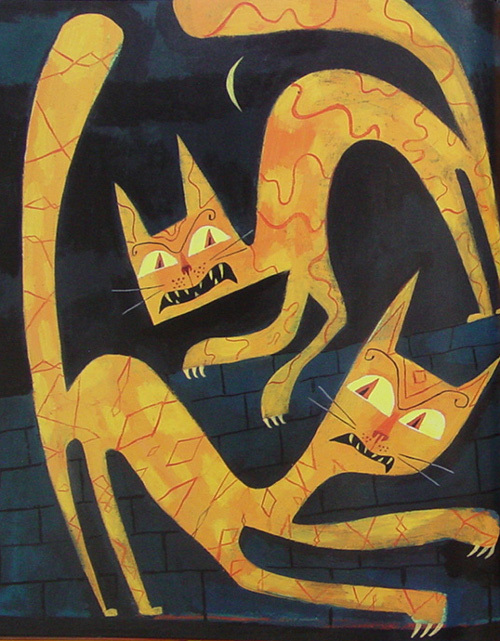 Now, back to Calef’s illustrations. 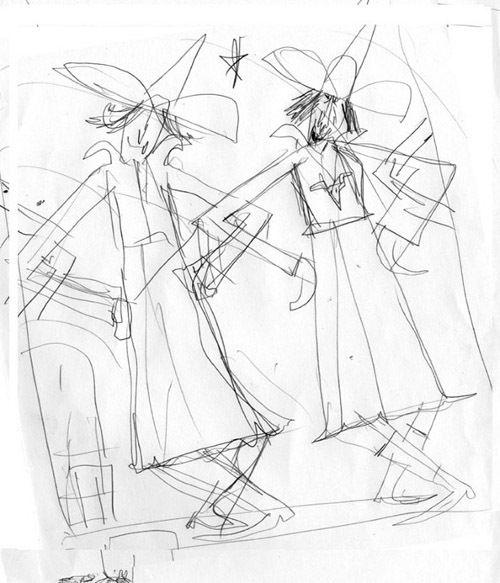 Below are some spreads from the book—each illustration is followed by its poem—as well as some early sketches from the book. 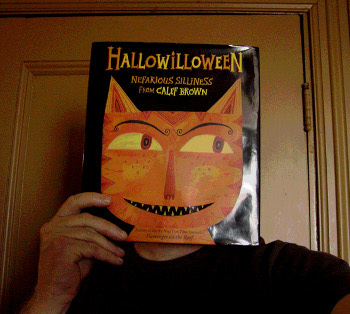 Note: Calef recently posted a short YouTube video of himself reading from Hallowilloween, “preceded by,” he told me, “a rambling prologue or preamble, which I guess makes it a ramblogue, or a pre-ramble.” It is here. 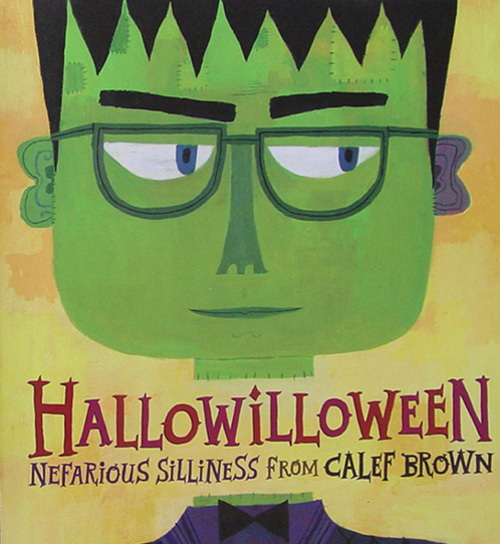 HALLOWILLOWEEN: NEFARIOUS SILLINESS FROM CALEF BROWN. 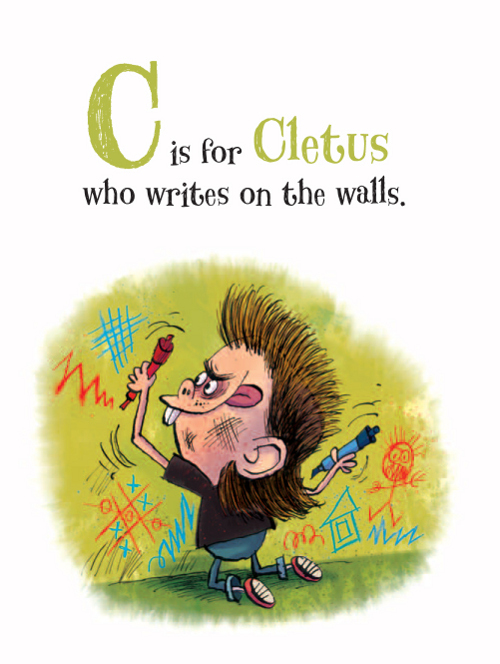 Copyright © 2010 by Calef Brown. Published by Houghton Mifflin Harcourt, Boston. Reproduced by permission of Mr. Brown. ALPHAOOPS: H IS FOR HALLOWEEN. Text copyright © 2010 by Alethea Kontis. Illustrations copyright © 2010 by Bob Kolar. Reproduced by permission of the publisher, Candlewick Press, Somerville, MA. ABSOLUTELY BEASTLY CHILDREN. Copyright © 2010 by Dan Krall. Published by Tricycle Press, New York. Reproduced by permission of Mr. Krall. I think I’ll skip kicks this week. And there’s so much art today anyway. I wish you all a happy Halloween. And I hope you don’t just get rocks in your trick-or-treat bags, like Charlie Brown. So, wait. Those were two kicks after all. Who knew. What about you? Anyone around today, or are you too busy chowin’ down on your Halloween loot? If you are, I don’t blame you. 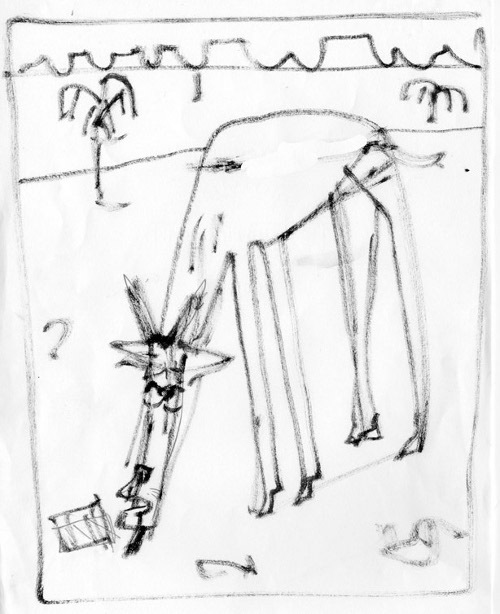 7-Imp can wait. Your candy goodness might melt, you know. Just flying by on my broomstick to wish everyone a Happy Halloween! Halloween alphabet books! 🙂 Love Tara who won’t brush her head especially. 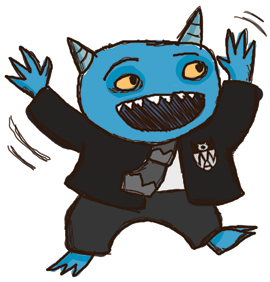 The blue 7-Imp monster is the perfect mascot! Hope he hangs around a lot from now on! National Cat Day on Friday! Had fun hosting a bunch of Krazy Kidlit Kats. Dylan’s latest CD, the Witmark Demos. Seriously cool stuff. Dylan laying down tracks at the very beginning of his career. Remastered, totally acoustic, gives me goosebumps. “The Times They Are a Changin'” sung with piano = so moving. Visiting Schuyler, VA (home of Earl Hamner, Jr., of Waltons’ fame). Will post pics on my blog soon. This is peak weekend for foliage in our area. Beautiful! Had the best fried chicken ever again at Michie Tavern in Charlottesville, VA.
Have a good Halloweenie . . . . whooosh! 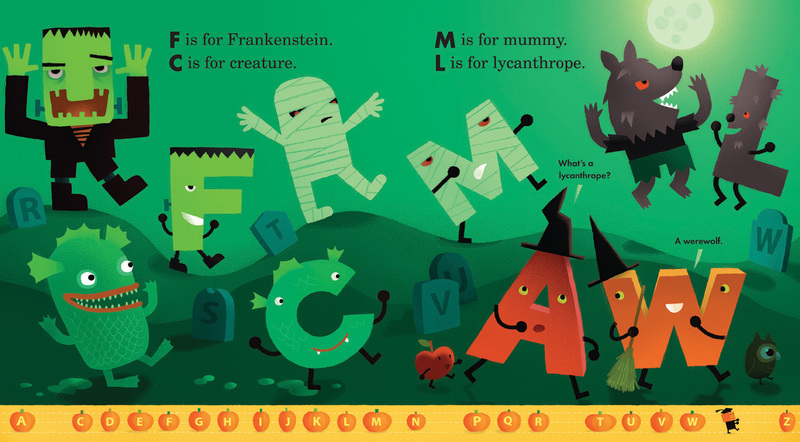 I always love seeing very cool Halloween books. The art is fabulous. Jules, so good to have wonderful friends, isn’t it? Jama, I really hope there will be color for my visit to NJ in 10 days. Not many kicks this week. All over shadowed by the loss of my sweet, Rusty boy. He loved to sleep in the crook of my arm. I am going to the zoo with grand girls today for Halloween. Happy Halloween! 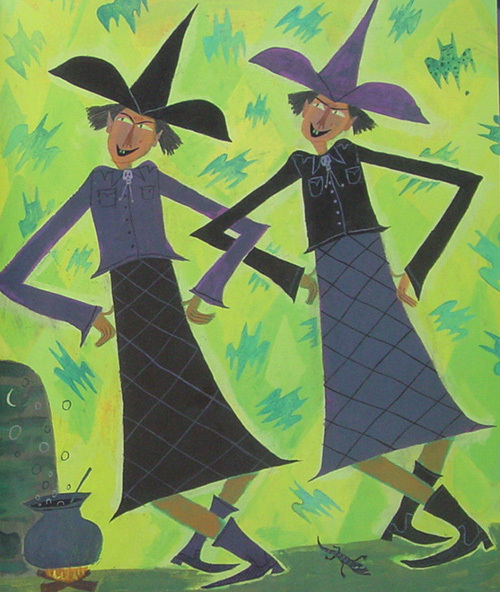 I love Calef Brown’s books! Great art today. Really fun. Brilliant and silly. Drove all over Austin with my teen last night looking for spiderwebs. Found them at the University of Halloween in the Dobie Mall by UT campus. As we walked by the students, I kept thinking, ‘Some of these kids look like they could be walking the halls of my teen’s middle school.’ And then it hit me, five years, just five short years and she’ll be a college student. 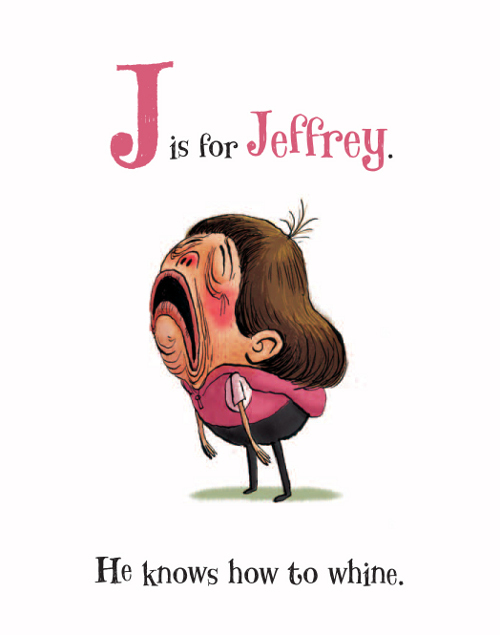 Wahhh…my face looked like J is for Jeffery. I kept it to myself though because the teen and I were having a most marvelous evening shopping for spider webs and pumpkins and eerie green lights (The list grew) and as we wended our way from store to store, we were mom and daughter and peers and girlfriends and all that is complicated and wonderful in mother/daughter relationships. Yay for cats and kicks. Hugs to Jules. Hola to the Imps. This is a fly-by post filled with glee! Monday: Auditioned for a film. Tuesday: Found out I booked the webseries I tried out for the previous week. Auditioned for another short film. Found out I booked the film from the day before. Wednesday: Auditioned for a new musical. Friday: Dressed up as Abby from NCIS for Halloween events. Today: Filming an anti-bullying short, and I have to leave right now! Good wishes for all those auditions, Little Willow! Thanks for sharing the poem, Steven. Is there really a national cat day, Jama? Thank you for all the excellent Halloween art, Jules! 1. Our neighborhood decided to do trick-or-treating this year and it was last night. So much fun! 2. I read Heidi for the first time. It was relaxing without all the tension that is built into modern stories. 3. I am part of an awesome art critique group and recently I added a page so we can critique each other’s writing also- it’s catching on! 4. My new edition of artist books now have covers that will be really cool when they are done. 5. Every time I go to our library I can’t believe how wonderful it is. 6. Thanks for all the great posts here on 7 Impossible Things!!! Jama, ooo! ooo! I want to hear “The Times They Are A’Changin'” on piano. I do. I do. And I must see the new Kalman books. How do I not know about them? Jone, sorry to hear about Rusty. Have fun at the zoo with the grandgirls. Steven, I think “it was like I ran over a robot” needs to end up in one of your stories or poems. Have fun at the NYPL. Thanks, as always, for the poem. Lindsey, aw, man, I loved your story, bittersweet though it is. I have two daughters myself. Little Willow, congrats on booking the webseries and film and short film AND CALLBACK! WOOT! Hope you don’t have to wait too long to hear about the musical, and break a leg on Wednesday. Jill, I’ve never read Heidi either. I should fix that. You’re welcome for the posts, and congrats on the art critique group. That sounds like good stuff. Jama, here in north Florida our fall-foliage peak is currently scheduled for 7:12 am on Saturday, November 6. I’ll let you know how it went, unless I blink and miss it. A whole weekend, grr… jealous! Oh, Jone, so sorry to hear about Rusty. Trip to zoo with grandgirls will help! “Like I ran over a robot”: LOVE that, Stephen! And how that poem has escaped notice by the Teachers’ Anti-Defamation League I don’t know, but I’m glad it did. Lindsey: magical Halloween moments, those. Keep ’em in a treasure box. 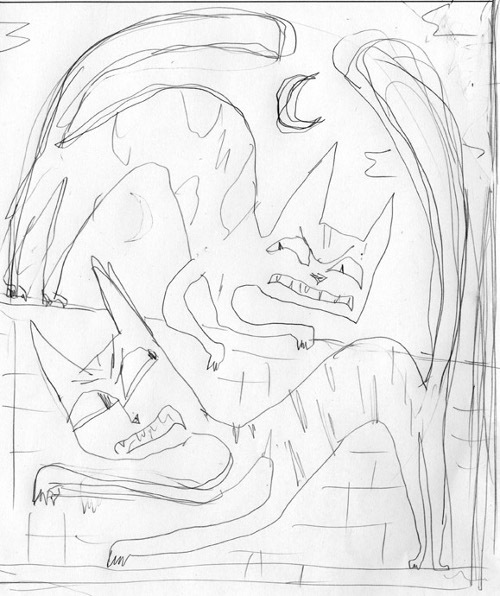 Jill B: very cool that you have both an art AND a writing critique group. Pretty uncommon, too, I’d guess! * Came up with a great idea for a single Christmas gift for a bunch of people. All it needs is time, that elusive old devil. * Learned a wonderful new cuss word yesterday, way longer than four letters but ideally suited for muttering under one’s breath over the course of a day’s exposure to the politics of relentlessness. * Videos of murmurations of starlings, something I didn’t even know of until this week. Duh. * The Pooch’s finally becoming a little accustomed to the hardwood floors. * In the NY Times, this hilarious series of illustrations on, umm, everyday physics. * Suddenly remembering this week that the TV in the bedroom has a DVD player built into it. And I’m embarrassingly unembarrassed by my excitement over this. * Also in the realm of guilty pleasures: a rate Sunday-morning treat, those ridiculously easy to bake Pillsbury cinnamon rolls in the pressure-packed tube. Halloween is my favorite holiday! 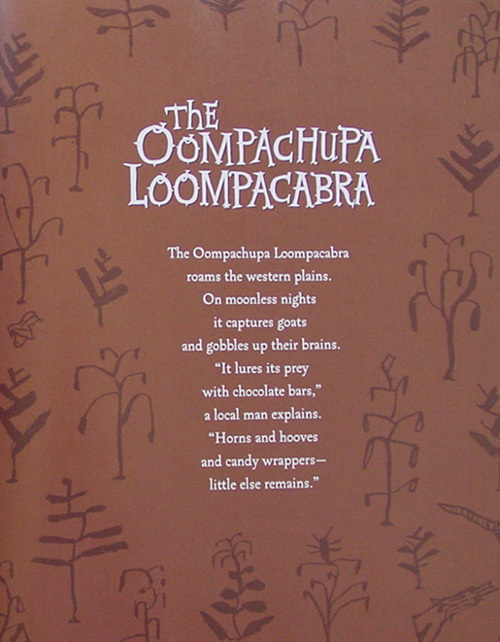 Jules, thanks for TREATing us to such tasty books this Halloween morning. 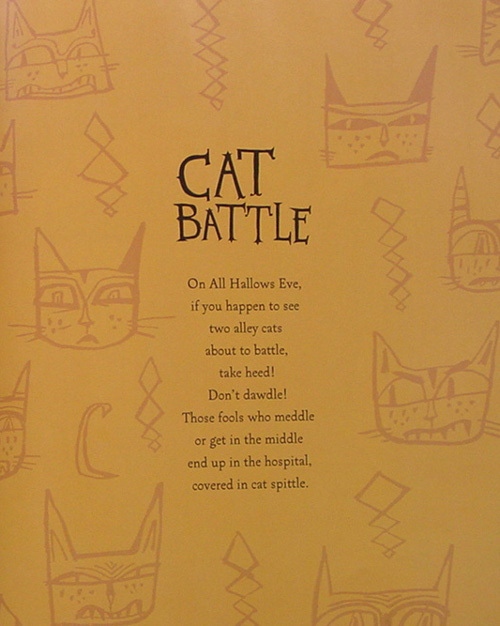 Calef Brown is always a hoot; those battling orange cats are graphically great. And how does Bob Kolar get his illustrations to actually glow green?! No kidding they’re “jewel toned”; they’re like the Emerald City undersea! 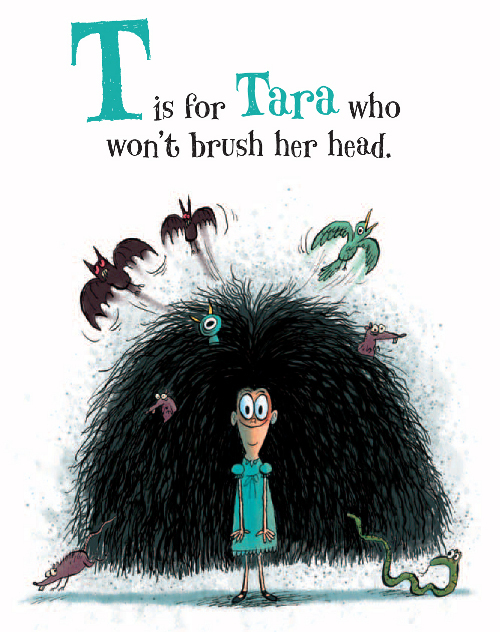 I ditto jama’s comment about Beastly Children – Tara’s hair is intriguing. 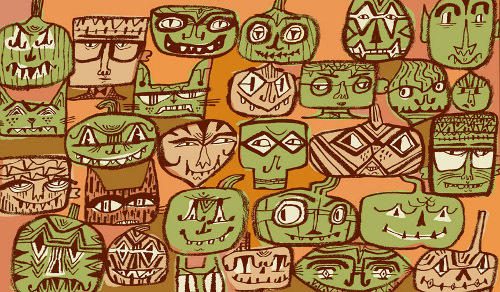 What a fun potpourri of Halloween art. Thanks so much! jone – sympathy for you loss. Envious of your ZOO destination (see my kicks). Steven – “She ate a kid who missed the bell.” Ha-ha! Lindsey – What a lovely paragraph about you and your daughter’s outing. LW – She shoots (for parts), she SCORES several roles. Wow, and how. You-go-girl! Jill – I second your appreciation of critique groups. Good luck with new expansion. JES – “the polictics of relentlessness” says so much. You are a phrase-master. I’ve seen ‘schools’ of starlings – now I know what they are called. 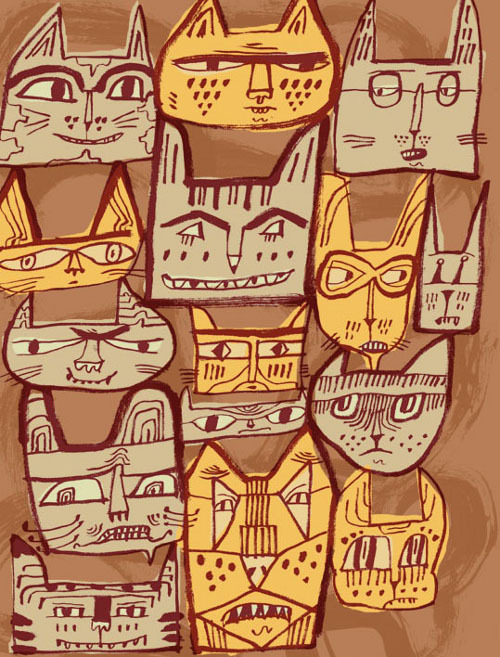 NYTimes illos – HA. 2. Found Reese’s peanut butter cups, full size, fresh and half-off. (!) You know what’s being handed out at my door tonight. Lots of fun vids, but my favorites were: – Big Cat Halloween – tigers diving into pool after pumpkins. – Pumpkin Enrichment Fun at Colchester Zoo – baby rhino so happy he hops! – Hallzooween with polar bears – with enrichment explanation. 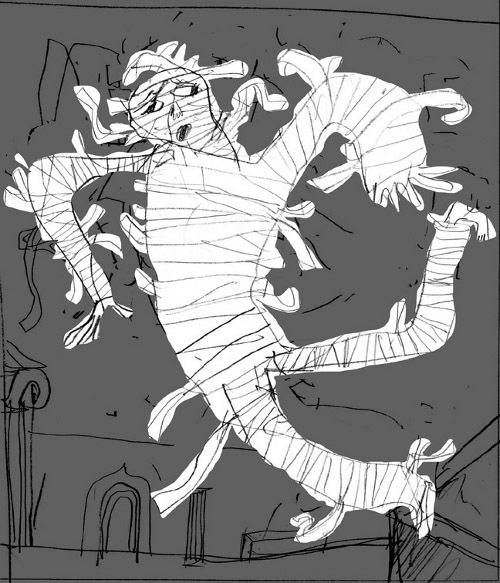 Jules I love the 7 imp monster! So cute! Jone, I’m sorry to hear about your loss. Denise, I loved those photos! Great link! JES, you always say my kicks sound exotic and British, well your pressure cooked cinnamon rolls sound like that to me! Steven, thanks for sharing the great poem – and have a great time in New York, how cool to be at such a famous library. I’ve missed you all in the last couple of weeks! 1. Train trip to Amsterdam that we had planned before we knew we were moving was relaxing and fun. Lots of walking around and sitting in cafes. 3. A lot of English trees turn yellow rather than orange or red in autumn. Although this is less spectacular at a glance, I have come to appreciate the golden glow it creates on a sunny afternoon in the woods. 4. My work gave us a bottle of champagne for our engagement. We also visited the champagne bar at St Pancras station before going away, so we now feel like champagne experts. 5. Hearing my niece talk to herself and giggle every time I speak to my sister now. She is one happy little baby. 6. The house is littered with boxes that are half filled (or in the case of the bicycle boxes, are moved from one place to another in a fruitless search to find a place they do not block access to something useful like the washing machine or front door). Strnagely I feel fairly organised. 7. Everything booked for the journey home (via Asia) in less than three weeks! 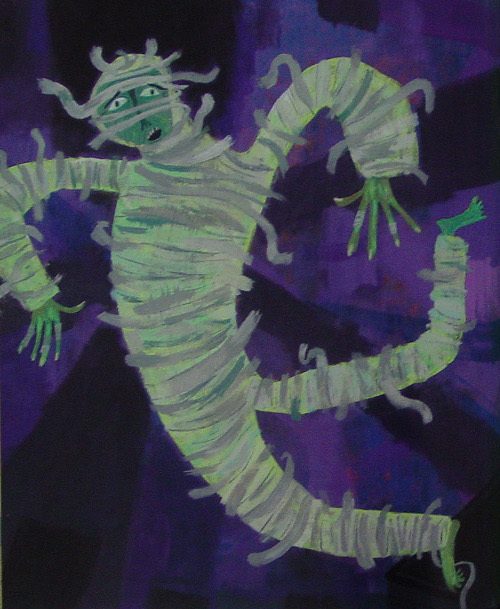 Thank you for a wonderful Halloween book and art filled posting. I am making a note now to refer back to this post next October! 1. Spectacular summit with RIF corporate funders in NYC. 2. Great FEAR book signing at Books of Wonder led by FEAR editor R. L. Stine. Followed by terrific reception held jointly with corporate summit attendees and other RIF family and friends. 3. A train ride from NYC to Charlottesville, VA on Friday under a blue sky with varying cloud patterns from place to place. And a precious Halloween parade of children in full force as we passed through Orange, VA.
4. Wonderful 44th birthday party for RIF which also introduced friends to our new home in DC. Actual birthday is November 3…and thus begins an 18 month period of celebrating our 45th! 5. Finished my first ever book by Maud Hart Lovelace – EMILY OF DEEP VALLEY. What a treat! 6. A super session with the firm MOTHER; these super creative folks are working with us at RIF to take a look at our brand and more! 7. Precious pictures arriving yesterday and today of a little dinosaur in Arkansas who is having so much fun on this Halloween, his second one! emmaco: All right, now, listen to me. On the one hand, we have a reference to Pillsbury Poppin’ Fresh cinnamon rolls. On the other, we have Amsterdam, Robin Hood’s Bay, the notion of Asia as something to be traveled through, and the proper noun “St Pancras.” Right. NO CONTEST.
! )Yours and Miss Bird’s fuse blog delight and amaze me and enrich my life. Thanks to you I learned about Natalie Merchant and am so in love with the double CD and booklet. This is just one of the many gifts you and Betsy have given me! 2) Reading (well, sorta, cause there are only 2 words in the book) “Mommy” by Sendak to the kids at my kinderladen…they adore that gem of paper engineering! OK, the last couple of weeks were prettty eventful, JES. But I can definitely promise that the international train trips will cease when I get back to Australia! I’ll be over for cinnamon rolls next week, and thanks for sharing those cartoons. Denise, I KNOW! (About the glowing green Kolar work). Wow, huh? And, yes, John is a phrase-master, huh? I keep telling him this. Thanks for all the Halloweeny, pumpkin-y kicks. Emmaco, you’re going home SO SOON? Wow, I didn’t realize it was that soon. Happy engagement once again! And I love yellow and would love all those yellow trees. Carol, happy birthday to RIF! And what a good week you had. Lisa, thanks! Glad you like it. Love all things Sendak myself, too. I hope you & yours had a loverly Halloween! 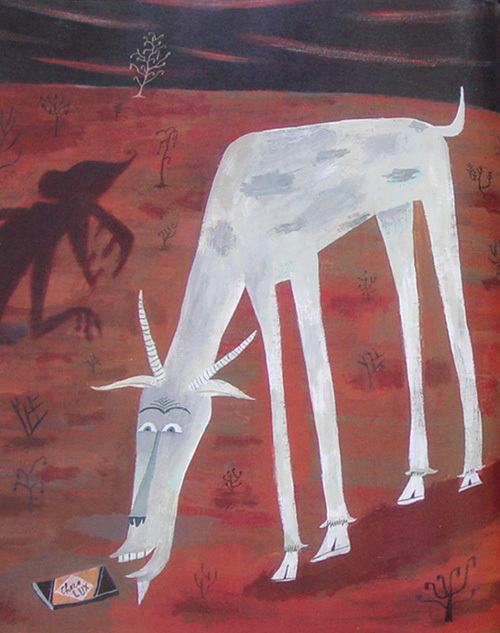 Looooove Calef Brown’s illusrations – so dynamic! Really cool seeing the B&W sketches and the final art together. The beastly children are hilarious, too. No morals necessary: illos. speak for themselves. Playing a duet of “Keep on the Sunny Side” with 6 yo (him, fiddle; me, piano) with no tears (from him, that is)! Watching 5yo ride off on her bike, zooming through the park with no training wheels, backdrop of fall leaves. Decorating the messiest Halloween cookies ever in 6 yo’s class (drizzle method of icing application = class full of Jackson Pollock wannabees). Having even my kindergarten art students recognize my slapped-together costume as “Dale Chihuly” (wild hair flipped over my head, eye patch, bundle of colored pencils in pocket, carrying blown-glass bowl). Thanks for the great Halloween features. See you soon! Jessica, YOU WENT AS DALE CHIHULY. That is the most brilliant costume I’ve heard of. Ever. I’m laughing so hard. I love “Keep on the Sunny Side.” What a good week you had.